I remember when my mother in law complained about getting spams, and a lot of spams daily in her free mail provider I told her to get her new email account in gmail. I guess she is happy now that she did it. Gmail becomes the most popular free email provider today, besides Yahoo or Hotmails. The reason is it has a very clean interface, and less of spams. And because of this, a lot of people also want to set their gmail accounts as their default email. This is when you surf on a homepage, you will often see mail to html code, like this Mail me. 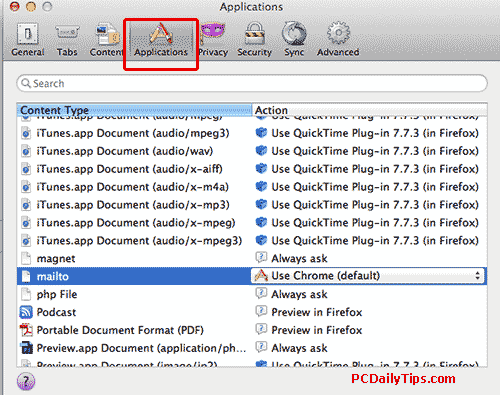 (warning it will open your mail programs or application if it’s clicked. 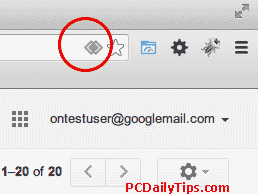 Googling around the gmail notifier, Google said, it’s no longer supported, but fortunately, with Chrome and Firefox, it’s very easy. So let’s get started with today tips. Using Version 31.0.1650.63 when this post is written. Click it. Choose “Use Gmail”. Click “Done”. This will enable you to click any mail link with your gmail’s compose new mail template. 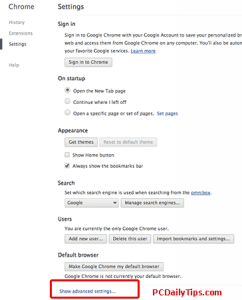 On Firefox “Preferences”, “Applications” tab, scroll and find, “mailto” and select “Use Gmail” as the action. We’re done. It will do the same like in Chrome above. 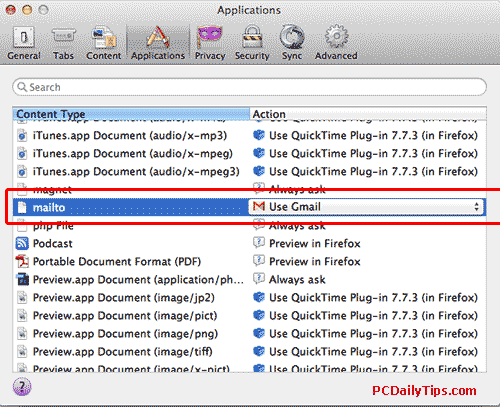 How to set your previous email app or program back? 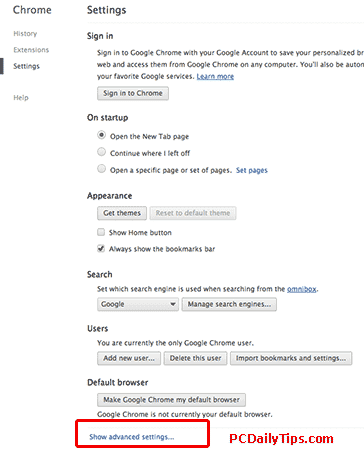 I mean, if you set gmail as default email, you will see mailto use Chrome (default) in Firefox preferences (as shown in picture below), how to use mail.app back? 1. 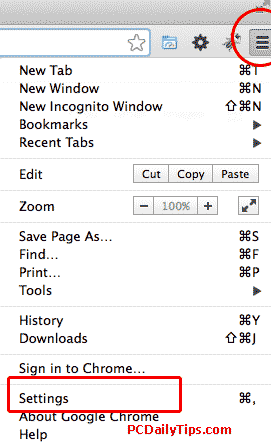 In Chrome, right top, you will see this button. Click it, select, “Settings” or CMD+,. 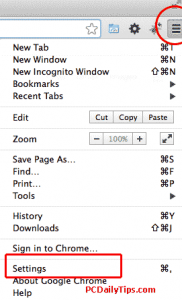 Scroll, and click “Show Advanced Settings”. 2. 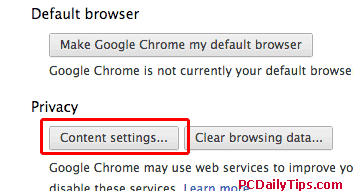 Under Privacy, click “Content settings..”button. 5. 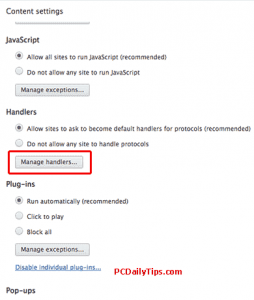 In Protocol handlers, you will see the active protocol handlers, here, you should see gmail. Hover it, you will see “remove this site” link, click it, and then “Done”, “Done” button. 6. Then, in open your mail app, go to its “Preference”, “General” tab. 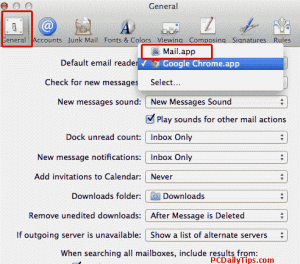 On “Default email reader” select “Mail.app” back, and it will be back to Mail app as the default app.